A large-scale composting operation, such as the one run by the SMSC Organics Recycling Facility, wouldn’t be possible without many different pieces of specialized equipment. 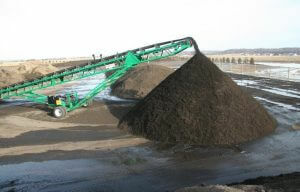 Heavy machinery is used every day to move, grind, mix, turn, and screen the compost. We’d like to highlight a few of the machines that make our operation possible. 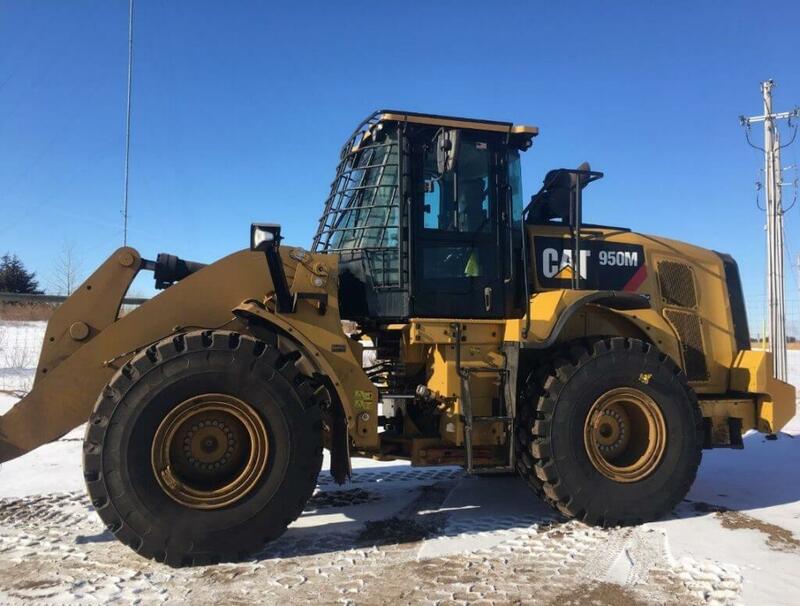 Arguably the most important piece of equipment we have on-site is our Caterpillar 950M Front End Loader. We currently have four loaders on-site that are almost constantly in use. 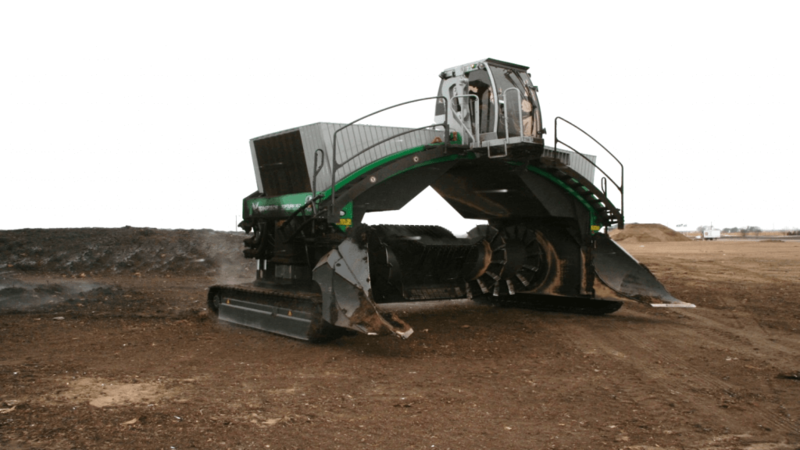 Front end loaders are essential for moving material in every step of the composting process—they load material into grinders and screeners, build and move windrows, and load customers with product for sale. Safety. Imagine hitting a basketball-sized rock at 800 rpm compared with 40 rpm! Quality Control. Film plastic is common in incoming organic material. A high-speed machine would turn this material into confetti that would be impossible to pick up from around the site and difficult to remove from finished products. Grinding the incoming material allows us to mix the feedstocks thoroughly, reduce the particle size of the material, and rip open any paper or compostable bags the material may have arrived in. 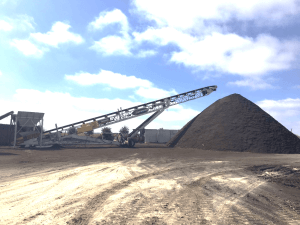 After material is ground up and mixed according to the proper “compost recipe,” a front end loader uses that material to build a 500-foot-long row of compost, called a windrow. A windrow’s lifetime lasts about two to three months, and during that time the material is actively managed. Another important piece of equipment comes into play at this stage, the Komptech X67 Topturn Windrow Turner. This machine is able to drive over the top of the windrow by straddling it, while the paddles on the center drum mix the material. It takes about 30 minutes to turn an entire windrow. This machine can turn windrows that are up to 10 feet tall and 18 feet wide. 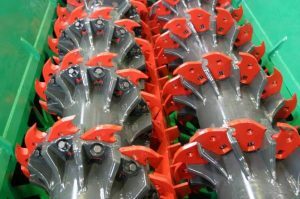 Each windrow must be turned with the windrow turner at least five times throughout its lifetime. The primary function of this machine is to blend material and incorporate oxygen, which is essential for aerobic composting. 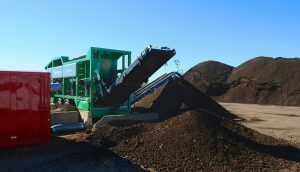 After windrows have finished the active composting and curing phases, the material is screened to take out any contaminants or larger sized material. We have two different types of screeners on-site. 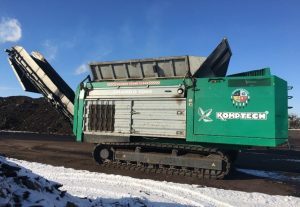 The one most commonly used to screen compost at the SMSC Organics Recycling Facility is a Komptech Multistar L3 Screener. This machine’s engine can run by diesel fuel or by electricity. Material is dumped into the top of this machine, and a series of star screens separate out material into three different sizes. The smallest sized material, screened to half-inch pieces or smaller, is our finished product and is ready for sale. The medium-sized material is reincorporated into new windrows to give the material another chance to break down. The largest-sized material, what we call “overs,” is generally large pieces of wood we put into our compost recipes as a bulking agent. The overs can also be reused in a new compost windrow. This screener also has an attachment called an Airlift Seperator. The Airlift acts like a vacuum inside the screener and is able to remove any pieces of plastic contamination that might be in the material. The last piece of equipment we are going to highlight is the stacking conveyor. The SMSC Organics Recycling Facility has three stackers that are used for many purposes. These machines have a conveyor belt that moves material away from the screener and allows us to make larger piles. One of our stackers—the Superior Pinnacle Stacking Conveyor—is a radial stacker which is able to turn as it is being used. This helps create larger piles and greatly reduces the number of times the stacker needs to be moved. All in all, these pieces of specialized equipment make operations at the SMSC Organics Recycling Facility possible. The hard work put in by our equipment—and by the skilled operators who run these machines efficiently and effectively—has enabled the SMSC Organics Recycling Facility to become the successful enterprise it is today.